Action Lab is celebrating its first five years as a creator-owned label with a wide-ranging adventure that brings together its mainstay characters, such as Jamal Igle’s Molly Danger; Vito Delsante and Sean Izaakse’s Stray; and Anthony Ruttgaizer’s F1rst Hero. Every Thursday through the Actionverse event, Vito will be talking with his fellow creators about the issue that just wrapped — with an eye toward what’s to come — in ACTIONVERSE AFTERMATH. Without a doubt, if there is a superstar in the Actionverse stable, it is Jamal Igle. Talented to a fault, and as gregarious as they come, the creator of Molly Danger has a lot of big plans in store for his heroine — and the comics industry! Vito Delsante: Jamal, you’re next up in the Actionverse relay race. 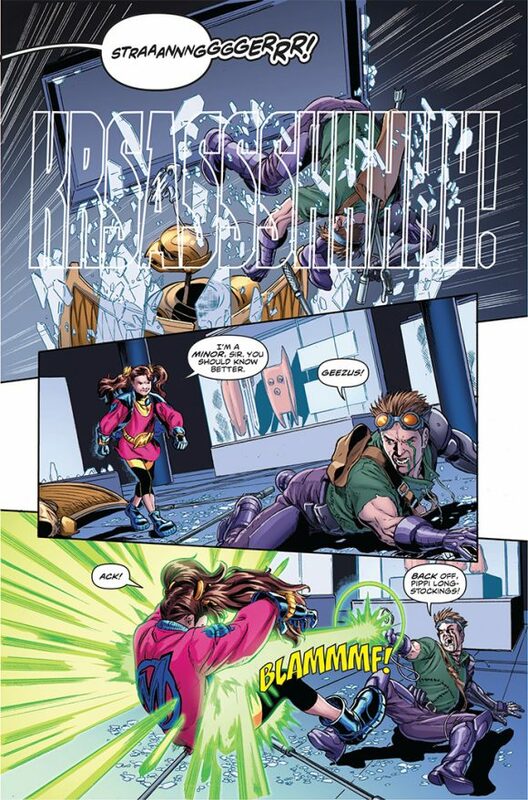 When last we saw Molly Danger, she was in Actionverse #0 (that is, before her appearance on the last page of Actionverse #1). For the uninitiated, and before we get into the meat, who is Molly Danger? 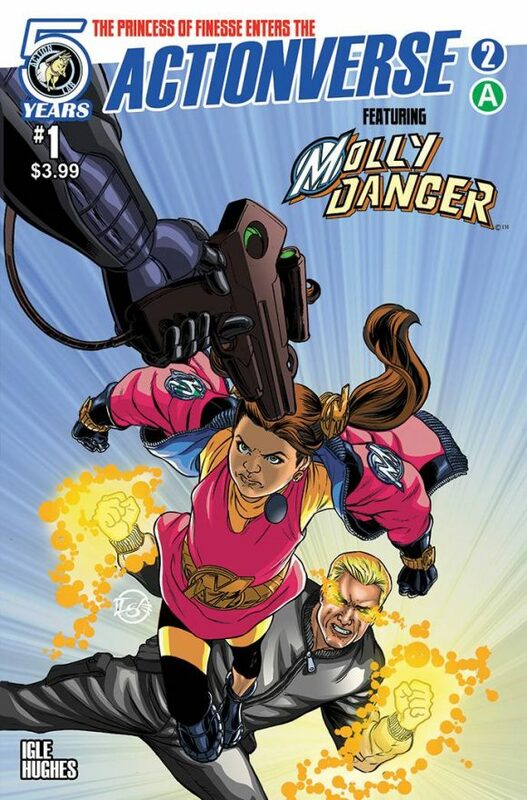 Jamal Igle: Molly is one of the most popular superheroes on the planet. Superhumanly strong, practically invulnerable and possibly immortal, Molly has been ‘10 years old’ for over two decades. In that time, she and her support crew, Danger’s Action Response Team (or DART) have protected her home city of Coopersville, N.Y., and the world at large from a variety of threats. Vito: Before her appearance last week, we last saw Molly taking a selfie with Midnight Tiger and Stray (in AV #0). Given that the events in that issue took place a little bit before this one, what can you tell us about “where” Molly was before we saw her on Page 22 of Issue #1? Jamal: Among Molly’s responsibilities, she has to spend a fair amount of time doing public relations. So when she’s not on a mission to save the world, she’s doing television interviews, appearances and signing autographs. The city of Coopersville thrives and survives on one major homegrown draw, Molly Danger tourism. People flock to their rapidly growing city to either catch a glimpse of Molly or a super fight that may break out. 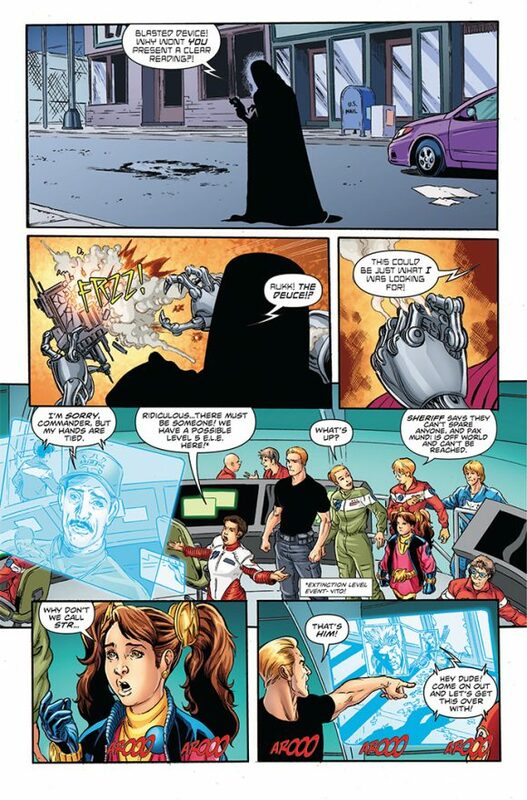 Vito: In Issue #2, we’re introduced to more members of DART. What can you tell us about Emma Bastian? Jamal: Emma is the head of security for DART. A Marine recruited straight out of Division of Public Affairs, she not only handles the comings and goings of the “green shirts” (DART security) she also serves as DART’S Head of Public Relations. She’s Commander Lauren Holder’s eyes and ears in the field. Her relationship with Molly is an interesting one, because, like her pilots, Bastion spends a lot of time with Molly and is probably friendlier to her than she should be. Vito: You’ve had some experience with crossovers in the past (notably on Countdown and War of the Supermen for DC Comics). Other than the fact that Molly is your creation, how does Actionverse differ from those other events? Jamal: Timing has a lot to do with it. We spent much more time crafting this story and everyone was super excited to work with each other. I think we were also much more invested because it’s a personal project for all of us. These are our characters, we want to represent them well and be as respectful to each other as possible. The amazing part is that we all seemed to be able to supplant our individual egos after a while and just do something cool. It wasn’t easy, we had to scrap the first version of the story when we saw a familiar log line for another company’s big crossover. However, what came out of it was much more fun and more intimate. Jamal: The work itself, frankly. Anyone who thinks these projects are easy to do is in for a surprise. Things have to line up and every artist is working at a different pace so that can be tough. I want to really commend and thank you, Vito, for the yeoman’s work on all this. You’re my hero, man. Vito: Aw, shucks! As the guy who helped shepherd this project, I feel like Molly has a definite arc in this. Other than our bombastic revelation on the very last page of Issue #6, and looking forward to the Molly ongoing, how do you see Actionverse affecting Molly? And try to keep this one spoiler free. Jamal: It won’t be obvious at first but Molly has a lot to think about. There is a new dynamic for her coming out of Actionverse, and she’ll reflect on her past more. It’s something she’s avoided but it’ll will feed into her storyline. Vito: I almost neglected to mention Medula! He’s actually a BIG part of Actionverse, but his role is kind of a mystery. How did we end up bringing in one of Molly’s arch-enemies into the story? Jamal: Every story needs a wild card and after a lot of debate, I offered Medula as part of the mix. I love Medula as a character, because to me he’s one part Doctor Doom and one part Doctor Smith from “Lost in Space.” He’s a blowhard, an egotist and a coward who also happens to be the smartest man in the room. When you have an X factor like Medula in the mix, you don’t know what he’s going to do, or bring to the table. You know you can’t trust him, but our heroes will discover that they need him. Vito: This one — I’ll admit, this is selfish of me, but — you and I have been friends for over 10 years, and we’ve spoken about collaborating in the past (you might not remember this, but you did a redesign of my character, Mister Mercury). And somehow, in the plotting of this mini, we discovered that our characters, that were totally created in two different rooms, so to speak, have a history. Again, I know we want to keep some of this close to the vest, plotwise, but my question for you is kind of a big one: When working on something like AV or our upcoming crossover, how much leeway are you willing to give when it comes to the history of your character? Jamal: Working on the series actually made me more open to working with other creators. I think that it’s more difficult because she’s “my girl” and I want to make sure her voice is right. If there are things that other people add that I want to incorporate, it works out better because it gives me a new angle to work from. Vito: You’ve made it very clear, very public, that your focus, both creatively and financially, is Molly Danger. And as a fellow creator, I’m sure that’s not easy. You’ve done a couple of shows since this announcement (most notably C2E2). Are you happy with that decision? Jamal: It’s been interesting because I’m sort of out there on a bit of a wire. There’s a refreshing quality to having to put the product forward instead of just counting on my name to pull customers in. I am happy, and I’m working on how to maximize what I’m doing in that regard. Vito: OK, Molly is coming back in the fall. We have Austin, Supermechs, Medula. Hit us with a tease that will bring us back to Coopersville! Jamal: The arc for the first year is called, “The Gathering.” We’ll meet people from Molly’s past and how they’ll affect her future. You’ll get a better idea of who Molly is as a person and why her presence in Coopersville is necessary for some and hated by a few others. You’ll see how Molly and Austin met. There’s going to be a lot of action as well, as we move into Year Two. Team-ups with a variety of characters. I want to build Molly’s world the right way and give readers a well-rounded, visceral adventure. 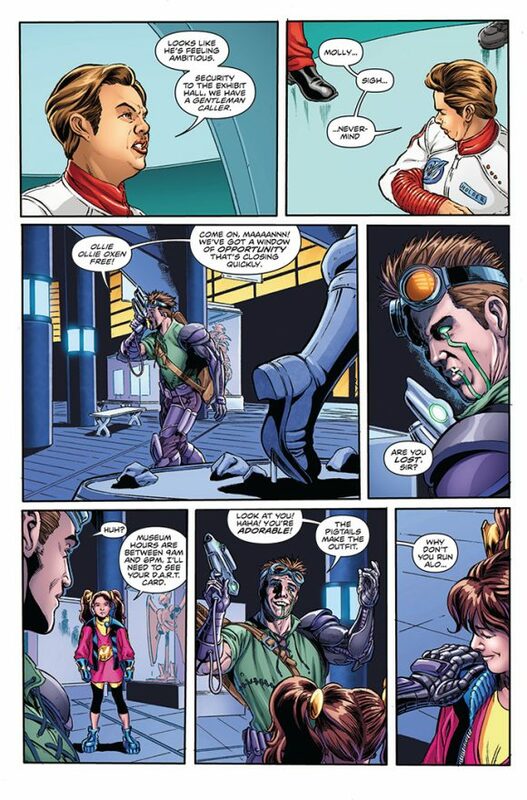 NEXT WEEK: Actionverse #3 … with Fracture by Shawn Gabborin and Chad Cicconi: Click here.